Dan Beaver, global associate with Grace Brethren International Missions (GBIM) who serves on the island of Boracay in the South Pacific, will be honored on the weekend of September 5 and 6 at the Illinois Renaissance Celebration at the University of Illinois, where he played football. According to his proud dad, Wayne Beaver, Dan will be among those recognized as having been the ten top players in ten different positions on the various football teams in over 100 years of Illini football. Dan will be honored as the best place kicker. 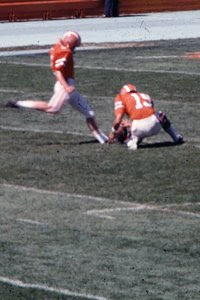 During his four years at Illinois (from 1973 to 1976), he kicked a number of recorded field goals over 50 yards (50, 52, 52, 55, and 57 yards). During his freshman year, as Illinois played Purdue, Dan scored five field goals, earning all the points, to beat Purdue with a score of 15 to 3. The same year, as Illinois played Michigan State, Dan scored three field goals, earning all the points, to beat the Spartans with a score of 9 to 3. He was a two-time All American and was selected to play in several post-season games. His 57 yarder is still a school record for the longest field in Illinois record. While at Illinois, he was president of the local chapter of the Fellowship of Christian Athletes. The top ten athletes will be introduced on the field during the Illinois vs. E. Illinois game at Urbana-Champaign on September 6. Dan and his wife, Tori, have served in the Philippines for the past 19 years with GBIM and First Love International Ministries. While I've never met him, I am good friends with Dan Bucher who serves alongside Dan & Tori in missions, and I think that we should have someone send the Brethren Missionary Herald some pictures of this. Being a huge sports fan, I especially enjoy knowing about sports ties to the fellowship like Tim Hutton who did a great job with USA Water Polo, and also Dan! Good stuff! And the coolest thing is I know that Dan will have a Kingdom Impact on the event for Christ, because people will want to know where Dan's working and what he's doing... a door open WIDE to share Christ's love... I am EXCITED!!! Coach Dan Beaver was my basketball coach throughout my high school years at Faith Academy, in the Philippines.With my parents far away , I needed someone to provide guidance in my life and to have my back. Coach Beaver did this for me. I am 30 now and still love to play hoops. He was much more than a coach to me, he taught me so many skills and lessons that I continue to use throughout my life. I will always be grateful to Coach Beaver and Tori for taking me under their wings. I seriously doubt I would have made it through high school without them going to bat for me! Thank you Coach Beaver!! I actually was at the Illinois/Purdue game 10/13/73 when dan beaver kicked the 5 field goals for the 15-13 victory. It really was electrifying. I was a freshman and my parents and aunt and uncle came down from Rockford to be with my cousin and I for ‘dads day’. It truly was a blessing and memory I’ll always cherish. God Bless Dan and his wife for their missionary work! Thanks again for that exciting game and now I see this year,45 years to the exact day(which will also be my 63rd birthday!,), the Illini play Purdue again in Champaign 10/13/18!!!! Wow!! !